Grease Traps are an effective and hygienic method of separating fat and grease from waste water flow. Grease traps reduce blocked drains, especially in catering establishments. Grease traps improve the performance of septic tanks and field drains, and prevent contamination of small sewage treatment plants. Grease traps are typically designed for small restaurants, public houses and canteens. Grease Separators are commonly utilised for in larger restaurants and hotels, etc. where a grease separator should be considered to give additional volume. Grease traps improve the performance of septic tanks and field drains, and prevent contamination of small sewage treatment plants. 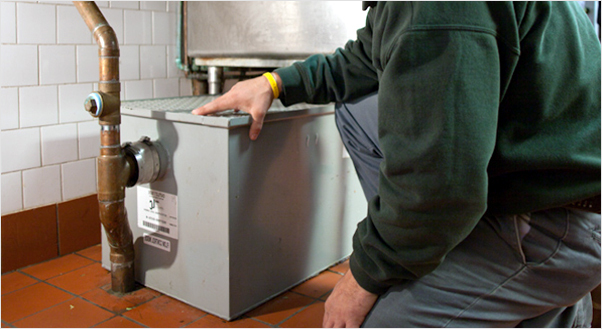 Grease traps are typically designed for small restaurants, public houses and canteens. Grease Separators are commonly utilised for in larger restaurants and hotels, etc. where a grease separator should be considered to give additional volume. Contact us for all your Grease Trap requirements in Dublin. When drains get blocked or stop working as they should, you need the problem solved quickly, efficiently and at a reasonable price. The Dublin Drain Company are specialists in solving drainage blockages and problems in the home or on commercial premises. No matter what the problem is, we have the engineers and equipment ready to fix. The Dublin Drain Company provides highly professional drainage and plumbing services and solutions. We pride ourselves in the quality of our workmanship and guarantee that all work is carried out to the highest of standards by our plumbers and drainage engineers. We are one of the leading drainage and plumbing companies in Dublin, providing highly professional drainage and plumbing services and solutions. If you are based in Dublin or the surrounding areas, then get in touch with us and we will be able to take on any drains and plumbing services requirements you might have, regardless of the size and complexity of the task in hand.